I had talked to the shearer the day before our scheduled shearing day, to make sure we were still on. I knew the weather wasn't going to cooperate and the forecast: COLD. I was a little worried, we have never sheared when it was this cold. I thought about putting it off, but knew that we needed to get it done before lambing time. After assurances from the shearer that the sheep would be fine, we decided to move forward as planned. I woke up to 10 degrees and a feel like of -2. Put on extra wool sweater and headed outside. We had done most of the set up the days before, (barn space emptied out, extra lighting set up, tarps laid out for fleeces, pen-gates-chutes set up). All we had left to do was move the sheep to the holding pen. That was easy, they were hungry and we had some hay. Sheep Shearer arrived right on time 8:30 a.m.
Set up his equipment in the barn. Mike decided to fire up a heater, in hopes it would take the chill out. First ewe bought in- Let's Begin! We had a field trip set up for the home school group. Shearing and a tour of the mill. With the cold weather, we cancelled the Mill tour and will schedule it for another day. Sheep Shearing still on. Out of the 30 plus people we were expecting we had about 10. I was surprised to have that many. 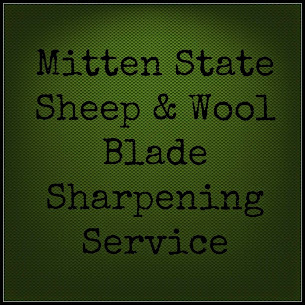 We shear once a year. The longer wool breeds could be shorn twice a year. Why do you shear them when they are pregnant? With the long wool breeds, lambs can have a hard time finding the teats in all of that wool. Without her wooly fleece, the ewe is more likely to take shelter in inclement weather, which means her lamb/lambs are out of that weather as well. It is cleaner when they lamb which means less problems later with flies, etc. and we can keep a better eye on the ewe's condition after she has been shorn. Why are you giving them shots? We do give the lambs shots when we dock their tails. (Tetanus). What are you putting in their mouth? When we shear we deworm the sheep. It is to control parasites that sheep can get. The parasites can remain dormant all winter, but when the ewe's lamb they become active. We give them a dose now and another when they lamb. What do you do with the wool? We have done different things with the wool over the years, with most of it being sold as raw fleeces. This year we are going to process it and sell rovings, along with some wool batts for comforters. Overall, sheep shearing went will this year. We only had one mishap- We had a Tunis ewe that we were taking over to the other barn (one with lambs) instead of putting her back outside. She wouldn't cooperate. She stepped in front of the Kerosene Heater and singed her leg wool. I knew it wasn't good when I smelled something burning. THANKFULLY, it was just her wool and she didn't burn her skin. Other than that, pretty uneventful! Now, to set up a skirting table and get busy with all of those fleeces! *We had technical difficulties this year and did not get a video made but you can check out last years if you would like. It will be interesting to see how you process the wool and how it turns out, especially with the different colors you have. We haven't had lambs in many years. I look forward to seeing all of yours. How many do you expect to have once they are all on the ground? We hope for twins from everyone, but usually our lambing rate is 175 percent on a good year. We have about 20 ewes that will be lambing soon. I expect anywhere from 30-40 lambs. You are going to be one busy shepherdess! That's a lot of wool! What do you do with it all? I am going to send some of the Tunis to be made into batts for lap quilts/comforters. Thanks for sharing on Farmgirl blog hop. I don't have sheep, but I have assisted a friend with the shearing a few times. She must breed them slightly later in the year than you do, because she doesn't sheer till it's warmer out (here in MA, that would be late April or early May). It's still before lambing, though. It works really well, because sheep get to keep their fleece during the cold weather, and by August their new fleece is not so long that it would make them overheat. Usually late March is warm enough her, but this year has been an exception! They are all doing well. Glad the one that got burned was ok. That must've been scary! Thanks for sharing. I am still trying to get up courage to do this. You have a lot of work ahead of you with that wool but if will be wonderful. How interesting! It sounds like you are going to be quite busy with all of the new lambs. Do you sell your roving and batting online? Yes, I am planning on setting up an Etsy shop for selling online. Once we have some processed I will post my store site.